Golf is a very adaptable sport, because it is more about will than ability. Golf is pretty fun. Even people who begrudgingly go with a friend to the course end up having a lot of fun once they start hitting balls around on the green. People everywhere play golf for exercise, fun and competition. Amputees can play. Leg prostheses have rotator joints and torsion absorbers that are perfect for golf. Adaptive hardware of this nature can let you complete the golf swing in a smooth fashion. If you cannot walk, golf can be played from a seated position in a specially adapted single rider golf cart. In fact, there are many adaptive devices that make golf accessible to players with disabilities. Even arm amputees can play golf; you can even play golf with one arm. For example, adaptive hardware attaches to a prosthetic arm and then to the golf club; this allows you to swing with both hands. You can find golf courses, golf events and clinics at Disabled Sports USA Chapters or Paralympic Club Directory outlets around the country. There are also other golf organizations that can help. Many states have golf associations you can join. One example is the Georgia State Golf Association, which has 75,000 members and 350 member golf clubs. Organizations like this can help you find everything you need to play the game. 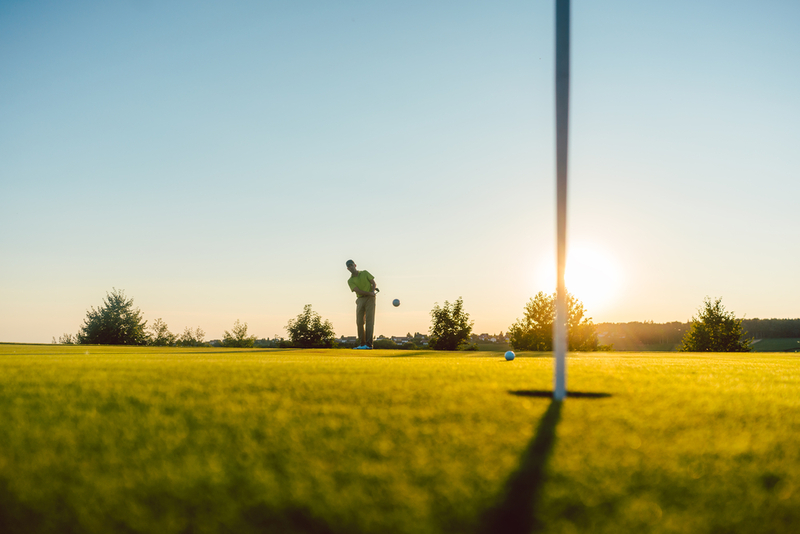 Golf is a great way to get out in the sun, do something fun and feel good about yourself. People who played golf before an amputation sometimes get frustrated playing afterwards, but some golfers report that their games have actually improved, or that they play just as well as they did before. All golfers range in ability and score; this is part of what makes golf so fun—you keep playing and keep tweaking your game to improve. Various golf associations are working to get more single-rider adapted golf courts on public courses, and more equipment there, too, for that matter. PGA tournament play golf clubs already have most of this equipment. What are you waiting for? Get out there and play. You’ll be surprised how happy you’ll be when that little ball goes up in the air and forward! Freedom and Safety are a Phone Call Away! How Long Does a Wheelchair Last? Alameda, Alpine, Amador, Butte, Calaveras, Contra Costa, Del Norte, El Dorado, Fresno, Glenn, Humboldt, Inyo, Kings, Lake, Lassen, Madera, Marin, Mariposa, Mendocino, Merced, Modoc, Mono, Napa, Nevada, Placer, Plumas, Sacramento, San Benito, San Joaquin, San Mateo, Santa Clara, Santa Cruz, Shasta, Sierra, Siskiyou, Sonoma, Solano, Stanislaus, Stockton, Sutter, Tehama, Trinity, Tuolumne, Tulare, , Yolo, Yuba, Alameda, Berkley, Concord, Napa, Oakland, Petaluma, Pleasanton, Rohnert Park, Sacramento, San Francisco, San Mateo, San Rafael, San Jose, Santa Clara, Santa Rosa, Sonoma, Vacaville, Vallejo, Walnut Creek and all points in between. © 2013 Lift and Accessibility Solutions. All rights reserved.